0.1 to 0.3% of people who take NSAIDs (Nzeako 2010). Mast cell activation (by IgE crosslinking or directly) leads to the generation of mediators (histamine, heparin, leukotriene and prostaglandin D2), which increases vascular permeability. An allergen cross-links two or more IgE molecules on mast cells or basophils and initiates a signal cascade leading to degranulation. Pro-inflammatory mediators then act on the mucosa and cause angioedema. These chemicals can recruit other cells, like eosinophils, and may lead to anaphylaxis. Release inflammatory mediators and lead to angioedema. NSAIDs hinder the formation of prostaglandins within mast cells and other leukocytes. This can cause an abundance of leukotrienes and other pro-inflammatory mediators and precipitate angioedema (Nzeako 2010). 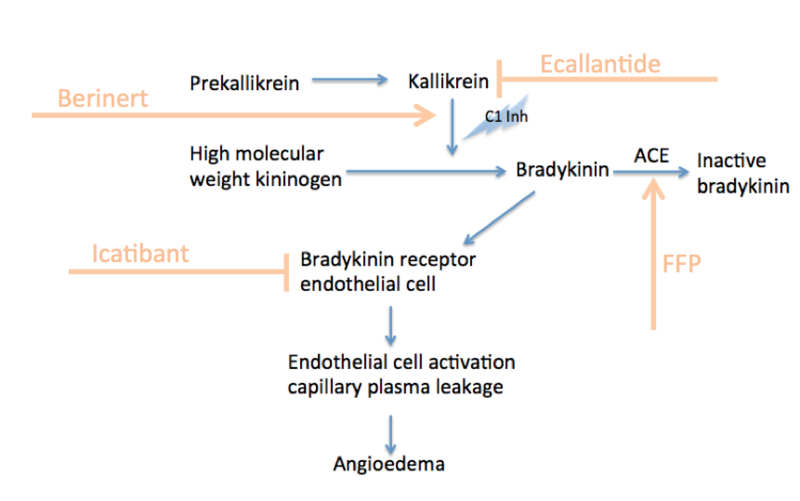 Plasma globulins called kininogens release bradykinin and cause vascular permeability. 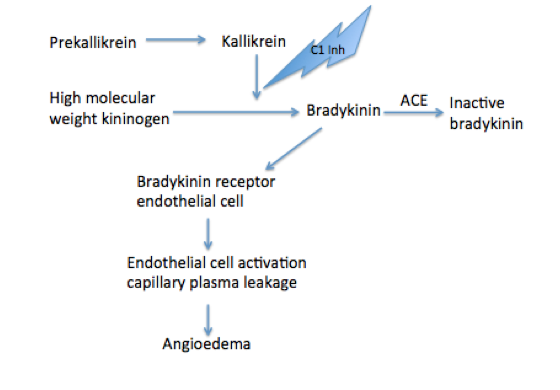 Inhibition of ACE hinders the degradation of bradykinin and can lead to idiosyncratic angioedema. 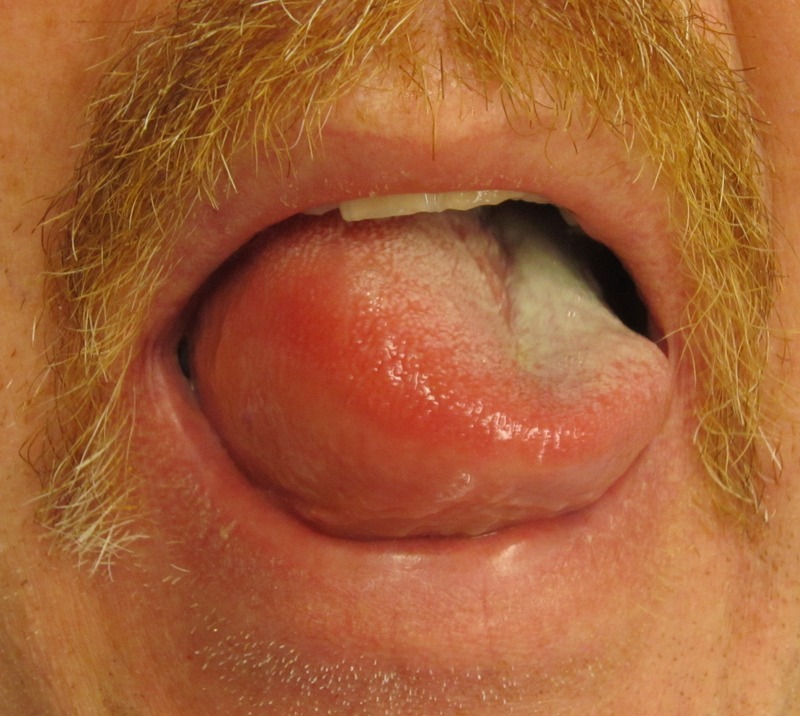 Typically involves the mouth, larynx, pharynx, and subglottic tissue (Kostis 2005). Both involve abnormalities in the level or function of the C1 inhibitor. Without the C1 inhibitor, the plasma-kallikrein-kinin system produces more bradykinin. Both conditions can range in severity from benign to life threatening (Wilkerson 2012). In pediatrics, illnesses like the common cold, Streptococcus pyogenes (GAS) pharyngitis, and urinary tract infections can cause isolated angioedema (without urticaria). Wilkerson RG. Angioedema in the Emergency Department: An Evidence Based Review. Emergency Medicine Practice. EBMedicine.net. 2012; 14(11). Zuraw et al. 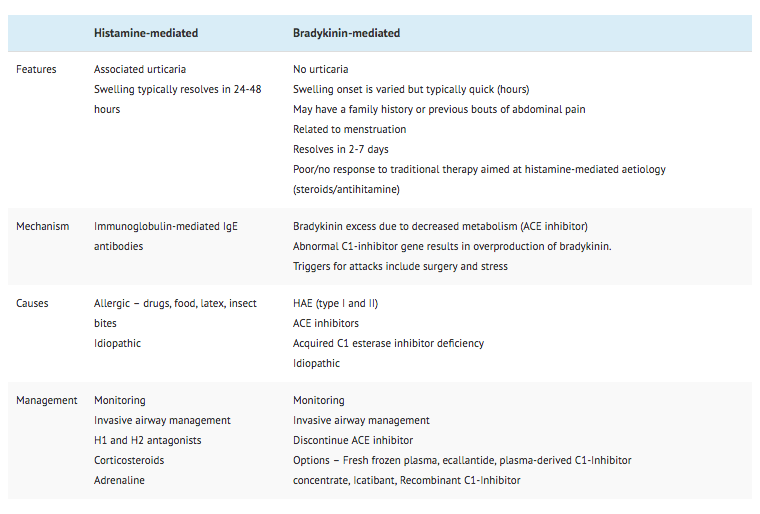 An overview of angioedema: Clinical features, diagnosis, and management. In: UptoDate, Feldweg AM (ed.) UpToDate, Waltham, MA. Zuraw BL. Clinical practice. 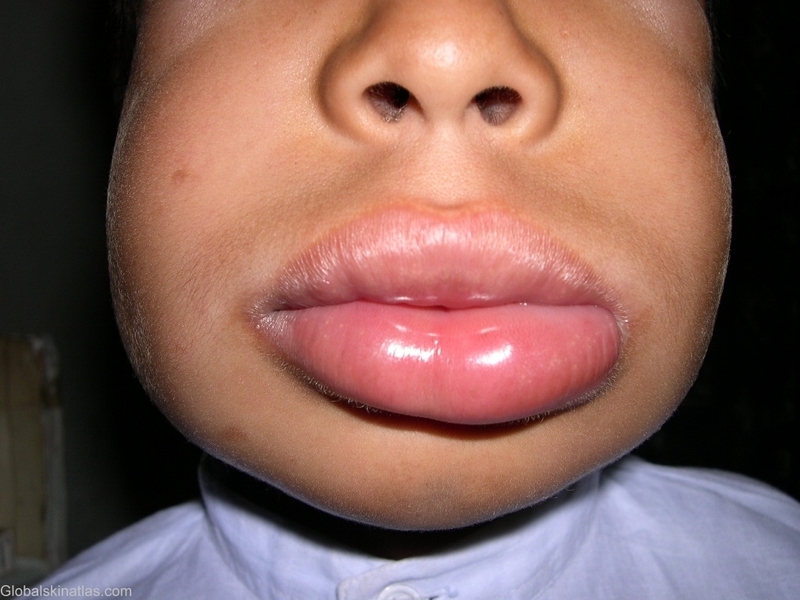 Hereditary angioedema. N Engl J Med. 2008;359(10):1027-1036.
please send references for do not manipulate air way…in this case. I did not but was told I should have. Sharon – I don’t think there’s much of anything as far as literature in angioedema, unfortunately. It’s a hard disease to study.